50-inches is just the beginning of your great adventure. 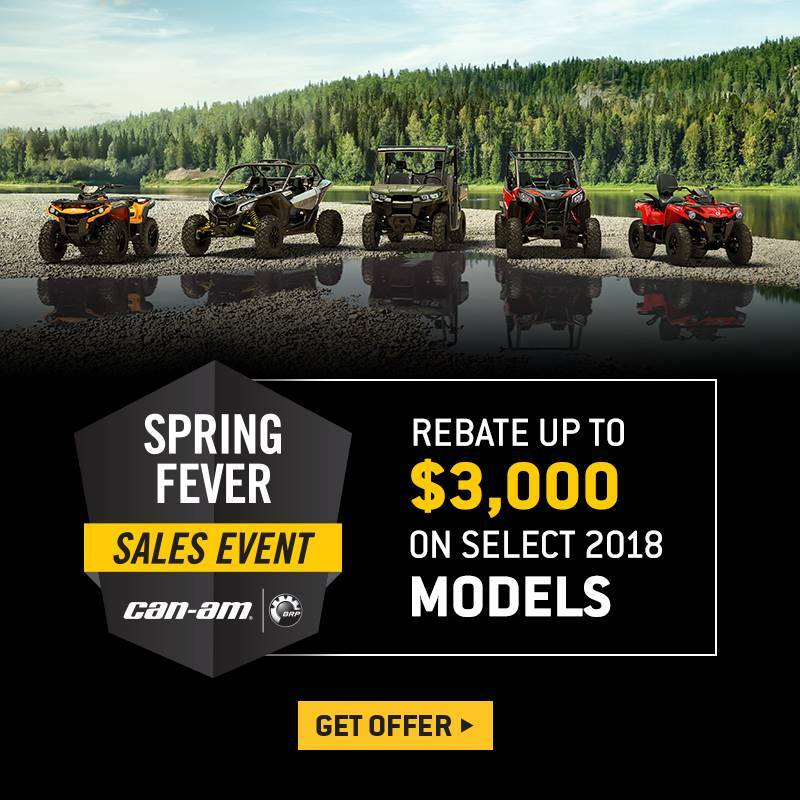 Can-Am’s engineering has been tuned to give the most comfortable, agile, and adaptable side-by-side vehicle ever—Where will you take the all-new Maverick Trail DPS? CALL THE CAVALRY: At your choice of 51 and 75 horsepower, the Rotax heart in every Maverick Trail beats to a battle-honed drum. We couldn't begin to list the adventures, racing wins, or achievements the 800- or-1000-cc V-twins have earned, which is in part why you're dreaming up where these torquey powerplants could take you. PREPARED FOR OVERTIME: In the decades we've been building recreational vehicles, we've overcome it all, and can't stress how well this combination of our new Quick Response System T (QRS-T) CVT transmission and Selectable 2WD / 4WD with lockable rear differential combine to meet your plans head-on. Now with high airflow ventilation and Electronic Drive Belt Protection, the CVT can apply Rotax torque over tricky terrain well into the night. TAKE THE REIGNS: With its Rotax engine, Can-Am powertrain, Ergo-Lok cockpit, and advanced suspension setup, the driver is meant to feel like we've got his back while navigating through a chosen route. Adjustable tilt steering, a thick-rimmed wheel, and a comprehensive multifunction digital gauge display are all you'll need to carry on—with Electronic Hill Descent Control when you need it. MADE TO MEASURE SUSPENSION: Designed for trail riding, the double A-arm front suspension and TTA-T rear suspension combine to offer up to 10" front and 10.5" rear travel. LOCKED AND LOADED: Ten. That's how many LinQ attachment points are built into the Maverick Trail. 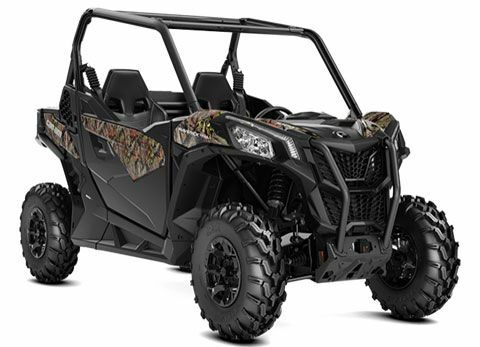 It may seem like overkill, but we know what this UTV is capable of—and that you'll want to use every inch of it. Choose from BRP-designed and engineered, gear bags, gear mounts, gun racks—more than 100 in all. In addition, all models come complete fitted with an accessory-ready 650-W magneto to handle additional electronics or Heavy Duty applications. FACE IT: The skid plate ads never tell you that being "tough" doesn't cut it when you're miles from the nearest cell tower. You want a vehicle that's mechanically robust, overbuilt, well-engineered—and then braced for battle. From its steel cage to integrated front steel bumper and injected full skid plates, the Maverick Trail is dressed and armoured to suit. WITHOUT QUESTION: When a vehicle is made right, its creators are more worried about durability than its owners are—they're too busy conquering mountains. Far be it for us to stand in the way of adventure, the Maverick Trail is sold factory-direct with 1-year of operation* before its first scheduled maintenance. This is in addition to a 6-months limited warranty and up to 30 months of available B.E.S.T. extended coverage. True 4 modes traction system - 2x4 open rear dif., 2x4 locked rear dif., 4x4 open rear dif., 4x4 locked rear dif. Visco-Lok QE auto-locking front dif.